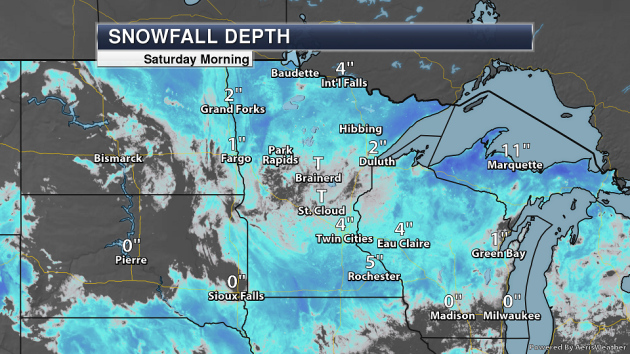 Even with warm weather in the Twin Cities Friday, the snow depth Saturday morning at the Twin Cities airport was still 4" - the same morning snow depth we've had since December 2nd. Meanwhile, the snow depth in St. Cloud had decreased from 1" Friday morning to a trace Saturday morning. Warmth the next few days should continue to help eat away at the snow pack across the region. 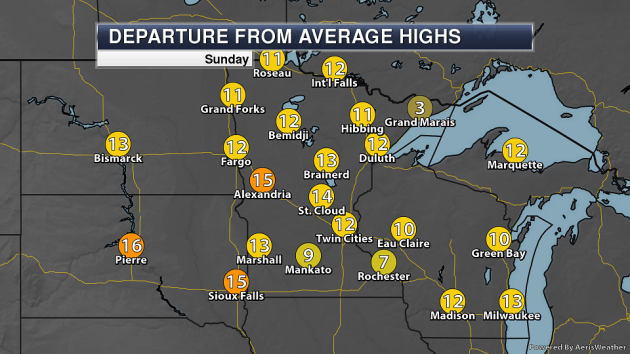 Who knew we'd be breaking record highs in mid-December across northern Minnesota? 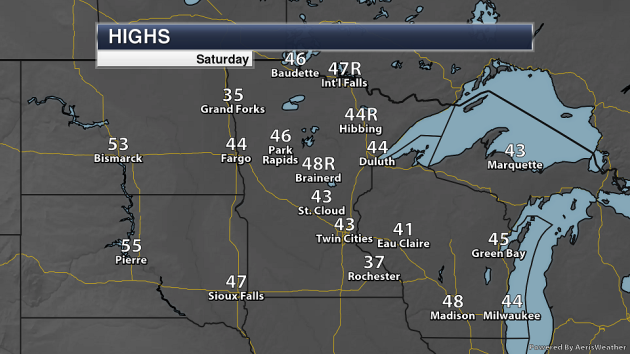 Brainerd, Hibbing, and International Falls all set new record highs today as temperatures climbed into the mid and upper 40s. Looking elsewhere across the state, once again you can see where there was still snow on the ground across southern Minnesota as highs were lower versus areas with little to no snow on the ground across central parts of the state. "In the depth of winter I finally learned that there was in me an invincible summer" wrote Albert Camus. Mind over matter, right? The other day my wife of 35 years told me how relieved she was not to be weeding the yard. 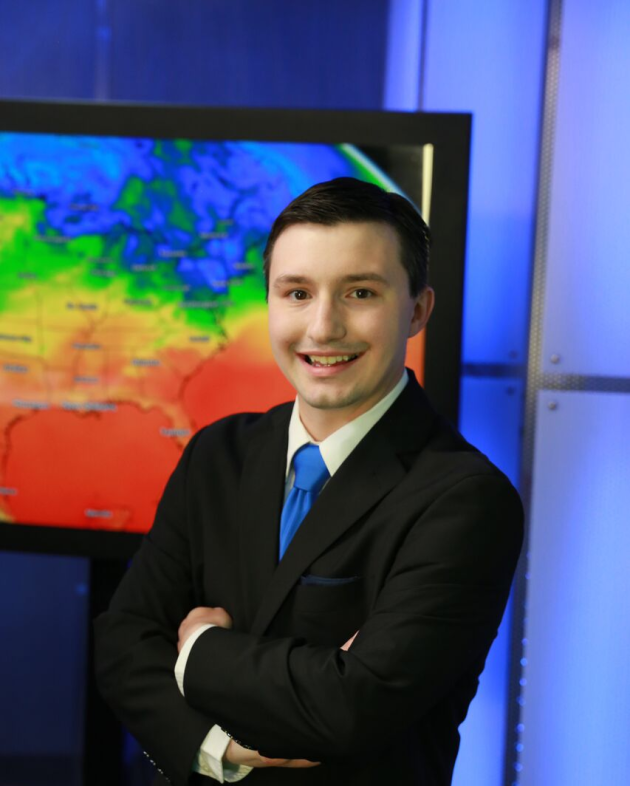 Hey, I love summer, but I don't miss obligatory tick-checks on our dog, or neighbors whining about humidity, or terrifying red blobs on Doppler. Winter is an opportunity to reflect, catch up on indoor stuff and ultimately acknowledge that we are not in control (of anything). If you don't like winter consider this: days start to get longer again in about 2 weeks; in one month average temperatures start to creep up again. El Nino winters are characterized by big storms on either coast and the southern USA, with more Pacific mild fronts reaching Minnesota. Canada won't run out of cold fronts anytime soon, in fact chillier weather returns around Christmas, with highs in the 20s and low 30s. Above zero. In the meantime our slow-motion meltdown continues, with daytime highs above 32F the next 7 days. We may top 40F today, Tuesday and Wednesday. With sunshine! SUNDAY: Plenty of sunshine. High 40. Low 20. Chance of precipitation 0%. Wind NW 8-13 mph. MONDAY: Blue sky, cooling off. High 33. Low 23. Chance of precipitation 0%. Wind SE 3-8 mph. TUESDAY: Partly sunny and pleasant. High 41. Low 28. Chance of precipitation 10%. Wind S 8-13 mph. WEDNESDAY: Considerable cloudiness. High 40. Low 28. Chance of precipitation 20%. Wind SW 8-13 mph. THURSDAY: Cooler, few flakes in the air. High 33. Low 20. Chance of precipitation 30%. Wind NW 10-15 mph. FRIDAY: More sunshine, probably dry. High 32. Low 24. Chance of precipitation 10%. Wind NW 5-10 mph. SATURDAY: Mostly cloudy, drama-free. High 33. Low 21. Chance of precipitation 20%. Wind W 8-13 mph. 2000: A surface low pressure system tracks east-northeast through Iowa on the 18th and then into western Illinois during the early evening hours. Extreme south central and southeast Minnesota received 6 to 10 inches of snow, including Albert Lea with 10.5 inches, Kiester and Bixby with 6.0 inches. 1972: Fairmont has its fifteenth consecutive day with lows at or below zero degrees Fahrenheit. 1940: A snowstorm hits much of Minnesota. Water equivalent of the snow was 1.27 inches at Winona. 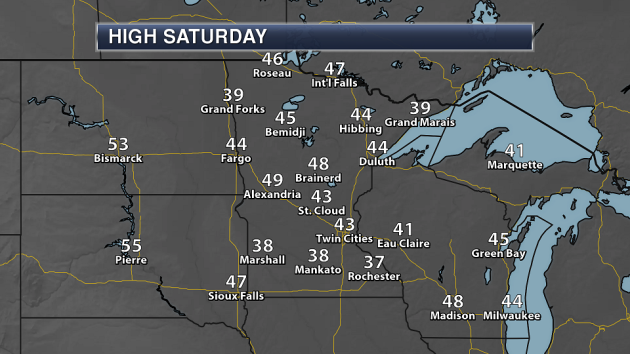 Another pleasant weather day is expected Saturday across the state, with highs climbing into the 30s for most locations. 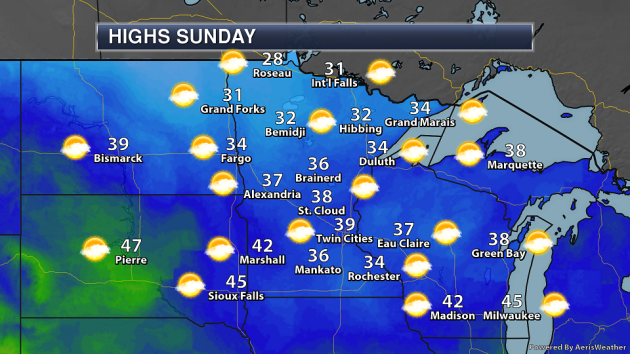 A few areas in northern Minnesota may be stuck in the 20s, while a few cities in southern parts of the state flirt with the 40s. 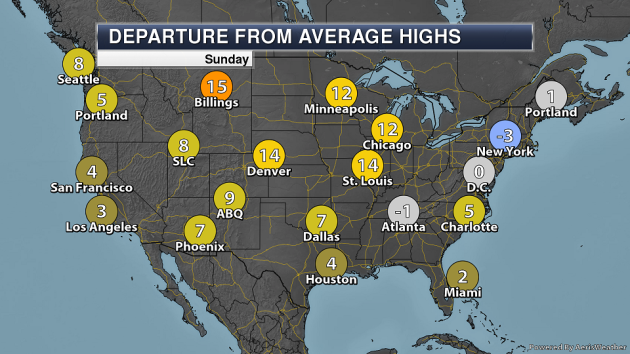 Across most of the state, highs on Sunday will be a good 5-15 degrees above average. After flirting with 40 this weekend in the Twin Cities, temperatures will continue to be in the 30s (potentially flirting with 40 again at times) through the end of the week. Some cooler weather is possible, through, next weekend and right into Christmas. Precipitation chances look light at the moment for the next several days, with a chance of some rain and/or snow Wednesday, then some snow next Saturday. Models are also indicating at least the potential of some fresh snow in time for Christmas Day - but it’s way too early to determine how that system could impact us. 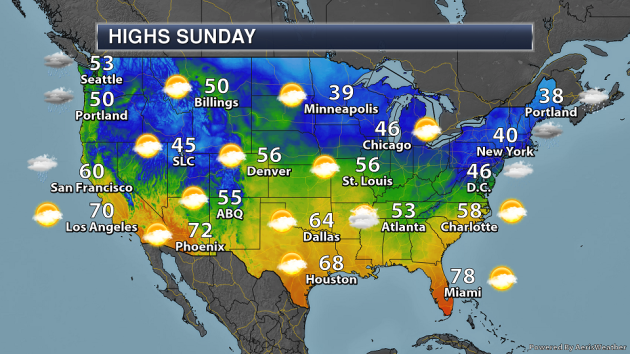 Rain will continue Sunday from the Mid-Atlantic into parts of the Northeast, with ice and snow possible from northern Pennsylvania into New England. 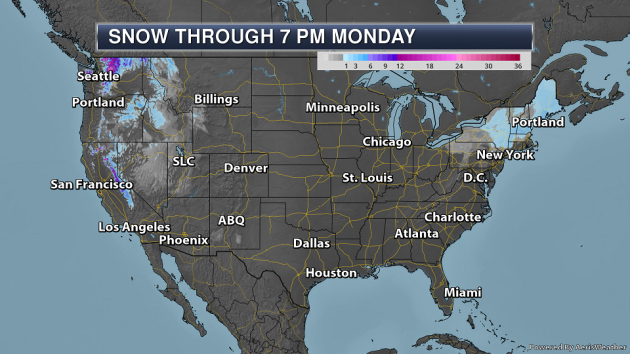 A new system pushing into the West Coast will bring rainy weather as far south as central California as well as higher elevation snow for the Cascades, Olympic, and Sierra Mountains. 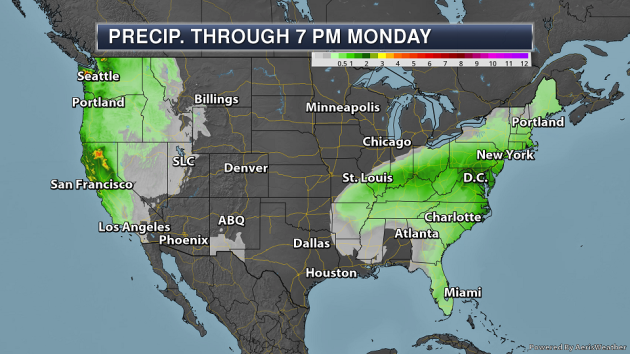 Out west, at least a couple inches of precipitation will be possible though Monday evening, with at least an inch possible as well from the Ohio Valley into the Northeast. The heaviest snow over the next couple days will be across the Cascades, Olympic, and Sierra Mountains, where over a foot could fall. Up to around 3” of snow could fall in parts of New England. 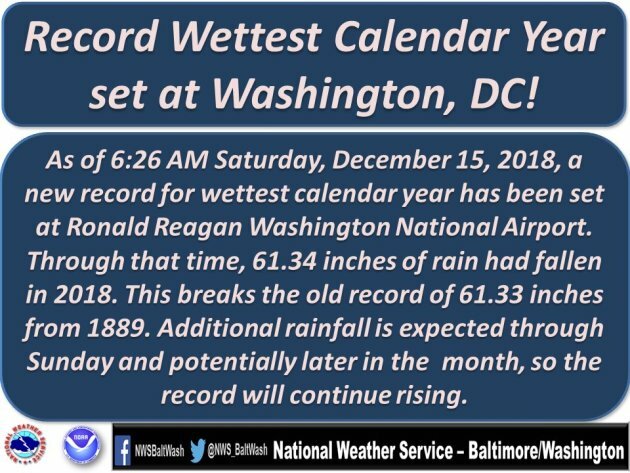 With rain falling in Washington D.C. Saturday, they received enough during the morning hours to reach their wettest year on record with at least 61.34" of rain falling. 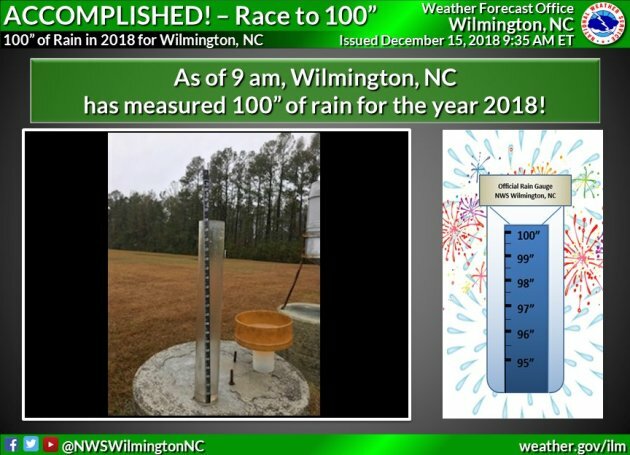 Meanwhile, a even larger rain mark was acheived Saturday morning in Wilmington, NC, as they reached 100" of rain in 2018. More from the Houston Chronicle: "A commission created by Gov. Greg Abbott after Hurricane Harvey released a report on Thursday that details more than 50 ways to better prepare Texas for future storms and other natural disasters. Beside making yet another case for an admittedly expensive coastal spine system to protect Galveston Bay from catastrophic storm surge, the Governor’s Commission to Rebuild Texas calls for better rules for contracting debris removal, more training of local officials on disaster response practices, less paperwork for victims of natural disasters who need aid and an improved radio system for emergency responders in the field." More from Climate News Network: "Thirty years ago it seemed like a dream: now it is a nuclear nightmare. A project presented to the world in the 1990s by the UK government as a £2.85 billion triumph of British engineering, capable of recycling thousands of tons of spent nuclear fuel into reusable uranium and plutonium is shutting down – with its role still controversial. Launched amid fears of future uranium shortages and plans to use the plutonium produced from the plant to feed a generation of fast breeder reactors, the Thermal Oxide Reprocessing Plant, known as THORP, was thought to herald a rapid expansion of the industry. In the event there were no uranium shortages, fast breeder reactors could not be made to work, and nuclear new build of all kinds stalled. Despite this THORP continued as if nothing had happened, recycling thousands of tons of uranium and producing 56 tons of plutonium that no one wants. The plutonium, once the world’s most valuable commodity, is now classed in Britain as “an asset of zero value.”"
More from Bloomberg: "Business leaders at a round of United Nations talks on limiting climate change warned that the rules envoys are drawing up are may be too vague to change the way they work. From the Swedish furniture supplier Ikea to candy maker Mars Inc. and telephone network operator BT Group Plc, companies are looking for a guide on where government policies on the environment are headed. Delegates from almost 200 nations have been working for almost two weeks in Poland to write the rules accompanying the landmark Paris Agreement. Yet delegates and observers to the discussions say what’s emerging from the meeting in Katowice is likely to fall short on specifics such as when more of the $100 billion a year in promised climate aide will flow and how a global carbon market might be revived. With U.S. President Donald Trump and the government in China pushing priorities other than the environment, companies along with pressure groups are voicing unease about the direction of the UN talks and the deal they are due to produce this weekend."